1. Gather your material. 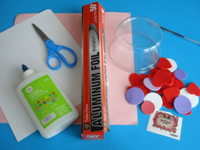 You will need a large piece of pink construction paper, a piece of white construction paper, aluminum paper, white glue and/or hot glue, a clear plastic container, scissors, a marker, Valentine's Day stickers and hearts. 2. 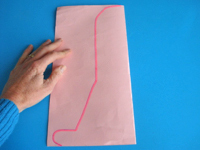 Fold the pink construction paper in half and draw the outline of one side of a gumball machine as shown. 3. Cut out the gumball machine shape and unfold it. 4. 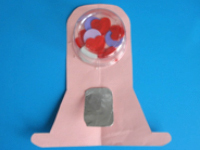 Set the plastic container on the top of your gumball machine and trace the outline. 5. 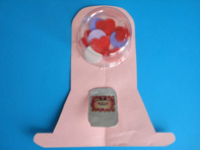 Glue several Valentine's Day stickers and hearts inside the circle drawn at the top of your gumball machine to represent gumballs. 6. 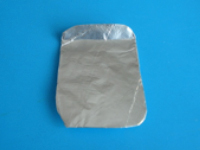 Cut a rectangle out of the white construction paper and wrap it in aluminum paper. Fold the top part of the rectangle. It will become the opening through which the gumballs fall out of the machine. 7. 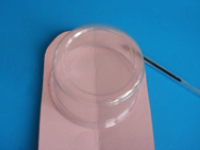 Glue the plastic container on top of the stickers. 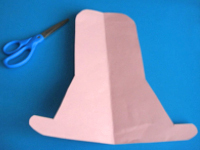 Glue the metallic flap under it, applying glue only to the folded section at the top so the flap can be raised. 8. 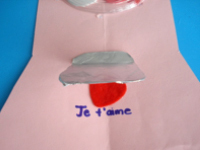 Add a heart-shaped sticker under the flap and write "I love you" or "Je t'aime". 9. To complete your gumball machine, add a pretty Valentine's Day sticker on the flap. 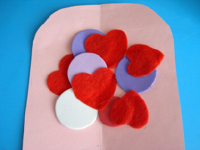 What a fun way to say "I love you" this Valentine's Day.